Bladder stones (uroliths or cystic calculi) are rock-like formations of minerals that develop in the urinary bladder. There may be a large, single stone or a collection of stones that range in size from sand-like grains to gravel. It is common for a mixture of both small and large stones to be present. What other kinds of stones are there? Gall stones form in the gall bladder and contain bile salts. Kidney stones are mineralized formations that develop in the kidney. Neither of these are directly related to bladder stones. Even though the kidneys and urinary bladder are both part of the urinary system, the development of kidney stones is not usually linked to the development of bladder stones. All stones form as a result of disease or inflammation in the affected structure. "The most common signs that a dog has bladder stones are hematuria (blood in the urine) and dysuria (straining to urinate)." The most common signs that a dog has bladder stones are hematuria (blood in the urine) and dysuria(straining to urinate). Hematuria occurs because the stones rub against the bladder wall, irritating and damaging the tissue and causing bleeding. Dysuria may result from inflammation and swelling of the bladder walls or the urethra, from muscle spasms, or due to a physical obstruction to urine flow caused by the presence of the stones. Veterinarians assume that the condition is painful, because people with bladder stones experience pain, and because many clients remark about how much better and more active their dog becomes following surgical removal of bladder stones. Large stones may act almost like a valve or stopcock, causing an intermittent or partial obstruction at the neck of the bladder, the point where the bladder attaches to the urethra. Small stones may flow with the urine into the urethra where they can become lodged and cause an obstruction. If an obstruction occurs, the bladder cannot be emptied fully. This is extremely painful, especially when pressure is applied to the abdomen. If the obstruction is not relieved, the bladder may rupture. A complete obstruction is potentially life threatening and requires immediate emergency treatment. How did my dog get bladder stones? 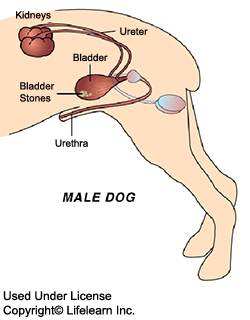 There are several theories of how bladder stones form. The most commonly accepted theory is called the Precipitation-Crystallization Theory. This theory states that one or more stone-forming crystalline compounds is present in elevated levels in the urine. This may be due to dietary factors or due to some previous disease in the bladder, especially a bacterial infection. Sometimes the condition may be due to a problem with the body's metabolism. When the amount of this compound exceeds a threshold level, the urine becomes saturated and cannot hold any more of the compound. The saturation level depends on the specific minerals that are present and the pH of the urine. The excess precipitates out of solution and forms tiny crystals. The sharp crystals irritate the bladder lining, causing a production of mucus. The crystals and mucus stick together, forming clusters that gradually enlarge and harden into stones. This is similar to the way "rock candy" is formed. "Bladder stones can develop in a period of weeks to months." "Most bladder stones are visible on radiographs (x-rays) or an ultrasonic bladder examination." Most bladder stones are visible on radiographs (x-rays) or an ultrasonic bladder examination. These diagnostic imaging techniques should be performed on dogs that show signs of abdominal pain or have recurrent episodes of cystitis. Some bladder stones are radiolucent, or are not visible on radiographs because their mineral composition does not reflect x-ray beams. They can be detected by an ultrasound examination or with a radiographic contrast study, a special x-ray technique that uses dye or contrast material to outline the stones within the bladder. There are three options for treatment. The stones can be removed by cystotomy, or surgically opening the bladder. This surgery is routinely performed by many veterinarians and dogs usually make a rapid post-operative recovery. Dogs with a complete urethral obstruction require immediate life-saving surgery. Surgery may not be the best option for patients that have other health concerns. It is slow. It may take several weeks or a few months to dissolve a large stone so the dog may continue to have hematuria, dysuria, and recurrent infections during that time. The risk of urethral obstruction remains high during this period. Not all dogs will eat the special diet. These diets will not work unless they are fed exclusively. In some selected referral centers, a third option may be available to remove bladder stones. This option is ultrasonic dissolution, in which high frequency ultrasound waves disrupt or break the stones into tiny particles that can then be flushed out of the bladder. Due to its lack of availability, this option is not widely used. It has the advantage of immediate removal of the offending stones without the need for surgery or general anesthesia. Prevention is possible in some cases, depending on the chemical composition of the stones. There are at least four types of bladder stones common in dogs and some of them are preventable. "They should be analyzed for their chemical composition." Whenever possible, bladder stones (either those that are removed surgically or those small ones that have been passed in the urine), they should be analyzed for their chemical composition. This will permit your veterinarian to determine if a special diet will be helpful in preventing recurrence. If the stones formed because of a bacterial infection, it is recommended that periodic urinalyses and urine cultures be performed to detect sub-clinical recurrences and determine if antibiotics should be prescribed. Periodic bladder x-rays or ultrasounds may be helpful in some cases to determine if bladder stones are recurring. Early recognition may allow your veterinarian to resolve the problem before your pet requires surgery.